President Barack Obama, Vice President Joe Biden, and First Lady Michelle Obama were in attendance for Team USA’s 80-69 victory over Brazil in an exhibition at the Verizon Center on Monday night. Lebron James led USA with 30 points, and the U.S. forced Brazil into 23 turnovers, taking control of the contest in a decisive 16-2 second quarter run. The President and Vice President receieved a standing ovation upon entry into the arena, but those cheers turned to jeers when Michelle refused to smooch her husband during the Kiss Cam Jumbtron segment. President Obama didn’t appear to be a fan of the wave at a Washington Nationals baseball game a few years back, so maybe his better half draws the line at these silly public displays of forced kissing theatrics. Couples who refuse to at least peck one another are usually mocked, subject to mass peer pressure by camera operators. 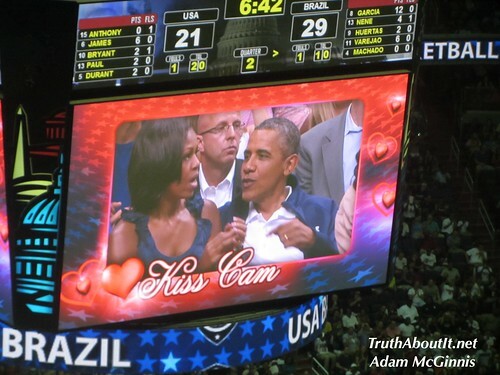 The First Couple did not receive any special treatment, the Kiss Cam returned to the Obamas in the second half. This time around, with their daughter Malia cheering next to them, Michelle relented and allowed Barack to lay one on her to the roaring crowd’s approval.